Wanna learn how to make fun, sustainable trail? Well, here's a little homework. 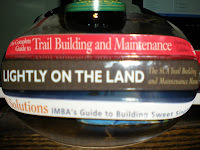 Lots of good ideas and techniques in these books on how to make a trail. To me, it's not just creating a path, but creating an experience. I can't say I'm an expert trail builder, but given the opportunity, i'd love to make singletrack trail for a living. Of course, you can't learn to build trail just by reading about it...you have to get your hands dirty and calloused as well. Recent discussions on our local forums has got people thinking on the right and wrong ways to do things, trail advocacy, trail building and politics. IT's all good really. With all this discussion and debating, hopefully some action and at least, some awareness will be spread. Trails don't come easy in this day and age. So many people want something and there's only so much land to go around. We need to protect what we have and appreciate our trails and the beautiful land that we can experience with two wheels underneath. Singletrack is also a lot of work. Many people enjoy what few people work their asses off to create. If EVERY rider gave at least 20 hrs a year to trailwork, our trails would never be unridable. If you think you're too busy to help out, then you're just making excuses.